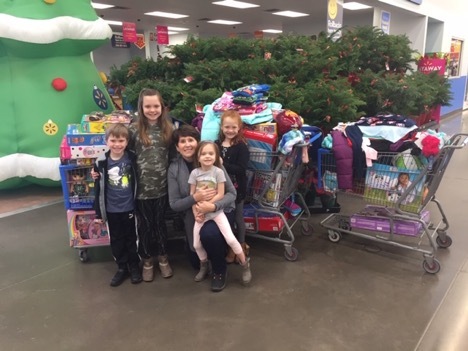 It has been our family tradition for many years to buy Christmas toys for children that might not have the opportunity to have a Christmas gift. We always include our grandchildren in this effort. We feel that it is very important to share the gift of giving. When they are very young sometimes they do not understand why we are buying toys for other kids; as they become older it is something that they look forward to every year. It is so interesting how they put so much thought into what they would like to purchase. We also include new pajamas, coats, gloves, and hats… the parents that pick these items out, not the kids. This year we made our donation to the Mountain Post Santa’s Workshop at Fort Carson in Colorado Springs. They are so organized!!! They have a room on post that they set up like a small store. Service members in need are invited in to select toys that they would like for their family. Pictured with the toys that we donated are Mellissa Stahl, Donna Handoe, Christina Svarstad, Nick Merrick, and Gary Gerza. Nick and Gary are members of the Green Beret Association. We are so excited to have found this organization. Their motto is, “Keeping the holiday spirit alive for the children of Fort Carson”. MPSW is a non-profit organization which runs on volunteers and donations. All donations are tax-deductible. I think this is a great way to support the men and women serving our country by helping their families have a wonderful Christmas!! The website for the Green Beret Association is www.greenberetassociation.org. This is also a wonderful organization that supports the soldiers that might have gotten wounded or killed in action. Check them out as well; they are always looking for donations. Thank you for your support of our business!! We at CM Designs, Inc. would like to wish you and your family a very Merry Christmas and a Happy New Year! 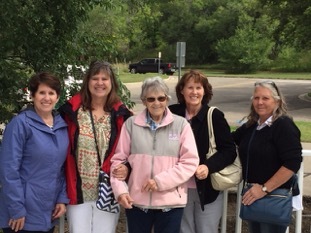 Every year my sisters and I take my Mom on a trip….we call it Girls' Week. It is always the last week in August. That seems to be the best time that we can all get together. We always let my Mom choose what she would like to do. She will be 84 on the 23rd of October and has a few health issues so we usually go someplace that we can drive. This year we went to Bismarck, North Dakota. For everyone that doesn’t know; my Mom and 2 sisters (Marie and Kathy) live in Glendive, Montana and my sister Susan lives in Billings, Montana, so Bismarck was fairly close. The first night that we arrived we went on a riverboat ride called the Lewis & Clark Riverboat. We were joined by two friends that live in Bismarck, Bruno and Cindy. Bruno has been a long time family friend; he likes to think that he is another brother….and we let him believe it. The weather was perfect and we had a great time. The next day we went antiquing, Bruno showed us all the antique stores. One thing that you have to know about Bruno is that he is a wonderful story teller. When we stopped for lunch, Bruno proceeded to start telling “Bruno stories”. He had us laughing along with others in the restaurant. There were a couple of ladies that had finished their lunch but just kind of loitered so they could hear Bruno’s stories. We went to the Double Ditch Indian Village State Historic Site. It is 24 acres that is one of the most spectacular archaeological sites in the Northern Plains. We spent one day at the North Dakota Heritage Center and Museum learning about the history of North Dakota. Outside of Mandan there is the Fort Abraham Lincoln State Park. It was from this fort that Lt. Col. George Armstrong Custer and the 7th Cavalry rode out on their expedition to the Little Big Horn. I wish that I had taken a photo of George Custer’s home. Also located at Fort Abraham Lincoln is an Indian Village called On-A-Slant. It has six reconstructed earth lodges that depict the lifestyle of the Mandan Indians, who occupied this site from about 1575 to 1781. On our adventures we also stopped at the Knife River Indian Villages National Historic Site. This site was home to a Hidatsa village with a total population estimated at over 3,000. This was very fascinating because they had a lodge showing what it might look like occupied by a Hidatsa family. The hole in the floor of the lodge was used to store their food. It was said that they stored seeds for planting for two years just in case they had a bad year. We had a wonderful “Girls' Week 2018”! Check out next year to see what adventure we go on. Carolyn was recently on the road again, teaching and lecturing at Thimbles quilt shop in Lockport, Illinois. Here's her report, just in! What a great time I had in Lockport - the ladies were wonderful! I met Jane and Tammy many years ago in an elevator at a hotel in Houston, TX. I will never forget meeting them….Jane came up to me and asked if she could touch me. That had never happened before!! She is officially known as my “stalker”. You will never meet two shop owners that have as much fun as Jane and Tammy. Their shop is located in an old mercantile building that was built in 1870. The main floor has the original shelving from the 1870’s. There is an old freight elevator that takes the sewing machines up to the second floor that they have renovated. The original oak floors are beautiful! Along with a beautiful building they have a wonderful selection of fabrics. If you are in the Chicago area be sure and stop by and see them….tell Jane that I sent you. While I was in New Braunfels, I stopped at the local quilt shops. The first stop was the Quilt Haus. Pictured with me are (left to right) Ruith, Lynn, Kellie, and Shirley. The Quilt Haus had a wonderful supply of fabric, notions, and patterns. What a fun shop! The next stop was Sew Little Time. It is a cute little shop that specializes in BERNINA sewing machines. Pictured are Kathy and Laurie - we had a great visit! I also did a lecture and a class for the New Braunfels Area Quilt Guild. This region has a lot of German heritage, believe it or not. The guild was a very nice group and made me quite welcome. From New Braunfels, we drove to Fredericksburg, Texas. Fredericksburg is a tourist town known for its wineries, so we decided to check out a few. After a couple of false starts, we found one that reminded us of something you would see in Italy - it was beautiful. We ordered wine and went out to the patio. The weather was perfect, and a little music was playing in the background. Heavenly! We were heading east from Fredericksburg and came to Johnson City. I had no idea that this was Lyndon B. Johnson's hometown! I should know my history a little better. The very nice clerk at the hotel suggested that we go to the Pecan Street Brewing for dinner. What a surprise we had that there was a live band playing in the back room! Their photo is at the top of this post. When they were on break, we got to visit with them and found out the man on the left has family ties to the Johnsons. His grandfather and Lyndon were best friends as children. They lived across the river from each other. He told us other stories as well. 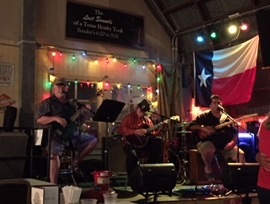 If you are ever in Johnson City on a Sunday night, check out this band...they are a very good country band and play Sundays from 6-9 PM. The next day we visited the Lyndon B. Johnson museum and then drove to the Johnson Ranch and did a tour of the "Western White House." Lots of interesting things to see, including Johnson's airplane. LBJ had a landing strip built on the ranch. He also wanted the ranch to remain a working ranch, so they still run Hereford cattle. To this day, they brand the cattle horns with the letters LBJ. Next it was on to Blanco, Texas, and the Uptown Blanco Textile Studio. Ruth, the manager, showed me around this beautiful store. It was an old mercantile that has been refurbished. I love all the refinished wood shelving; it is beautiful. They are turning the rest of the building into a restaurant. Be sure to stop, shop, and eat! In Port Lavaca, our next stop, we stopped by Beefore It's a Quilt and Gifts. The owner, Jean, was in the middle of teaching a class. The ladies graciously let me take a picture of them. They were surprised to have a visitor from so far away stop in their little town! I wonder if this Singer is related to the Singer who invented the sewing machine... If you know, please leave a comment! Finally, we stopped at the Quilters Patch in Victoria, Texas. I had a very nice visit with shop owners Karen and Sherry. I was even able to show Sherry how to use the Add-A-Quarter ruler with the stitch-and-flip technique. It will come in very handy with their current Block of the Month project. Karen and Sherry's shop was featured in the Better Homes and Gardens Top Shops Quilt Sampler for Fall/Winter 2015. It's quite an honor to be featured in that publication. If you have that issue, check out the shop on page 54! Then it was time to head home to Colorado. I hope you enjoyed visiting Texas with me! On a recent trip through Texas for teaching and sightseeing, I got to meet lots of new friends and visit with many long-time ones. Our first stop was San Antonio. The Menger Bar is located in the Menger Hotel a few blocks from the Alamo. It looks like an English Pub with dark-paneled walls. If those walls could talk you would hear some amazing history. It was established in 1859. The bar was used as a base to attract recruits for President Teddy Roosevelt's Rough Riders. There are even 2 bullet holes in the walls of the bar. Best of all, it is still in business today. Of coures, you can’t make a trip to San Antonio without going to the Alamo. We only had one day in San Antonio, wished we would have had more time…there was so much to see. We did take the time to go on a river boat ride; that was informative and enjoyable. When in San Antonio we stayed with my cousin Patrick, his wife Jill, and their 3 children Padraic, Conall, and Caelinn. It was so good to see them! After San Antonio, it was on to Gonzales, Texas. How did we get to Gonzales, TX???? A quilt shop of course, the only problem being that the quilt shop had closed. We made our way over to the county jail that was also the visitors' center, thinking the quilt shop might have moved. When we walked into the jail there was a tour just starting. The tour guide said that were welcome to join that tour or come back later when there were not so many people. She was in the process of giving the tour to a group of school children. Who should be coming into the jail right behind us but Leon. Leon asked, “Would you like a tour of Gonzales?" Not knowing anything about the town we said sure. Leon drove us around for about two hours telling us the history of his town….you could tell how proud he is of Gonzales. There are over 70 homes built before 1916. He told us that Gonzales was the start of the Chisholm Trail thus the home to many cattle barons. Leon was a true delight!!! If you would like to view the houses and buildings of Gonzales, log on to www.gonzalestexas.com, place the cursor on “tours”, and left click on “Historic Tour Overview”. The old jail in the background of the photo above was built in 1887, it cost $21,600.20 to build, and it was used until 1975. Gonzales is also the home of the “Come and Take It” cannon. According to Leon, Gonzales was once part of Mexico, and the settlers were having problems with the Indians raiding their town. Mexico gave the town a cannon to scare off the Indians. When war between Mexico and Texas started the Mexican government sent word to Gonzales for them to return the cannon. The response from Gonzales was “Come and Take It”. They buried the cannon so when the Mexican government came for it they were not able to find it….and the cannon stayed in Gonzales. There was a pretty Dresden Plate signature quilt on display in the Gonzales Museum. I could not find a date, but it looks like it was made in the 1930s. I also found the original documentation of one of the earliest Ruffling Attachments for Sewing Machines at the museum in Gonzales. It was displayed in a shadow box. I apologize for the glare off of the glass. I tried various angles but always got some glare. It is hard to read, but the attachment was patented on July 8, 1884 by Eugene G. Lauraine. Eugene was from Cuero, Texas, just 30 miles south of Gonzales. The patent number is 301,502. Thanks for reading, and please check back again soon for more of my adventures in the heart of Texas, including a great quilting class! I recently got to return to one of my old haunts, Bozeman, Montana. And as is true for most of my stories, this one had some quilting involved! 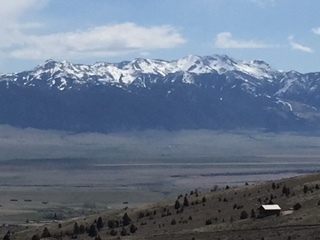 As you can see in the first photo, the Bozeman mountain range is gorgeous. This was my view when I lived here. And this is our nephew Ty, who graduated with honors from Montana State University with a degree in mechanical engineering and a minor in aerospace. Of course, the best part of going back to Bozeman is seeing my friends. I have been friends with most of them for over 30 years. There is nothing better than an old friend. Back row left : Colleen and I worked together at The Patchworks. We had a lot of fun working together. We even have a Dennis Quaid and Meg Ryan story. Colleens Mom and aunt started The Patchworks; it was the first quilt store in Bozeman. They were not only wonderful quilters but also amazing women. They sold the store to Margo Krager. I worked for Margo after she bought the store from Marilyn and Dee. Back Row right: Tracy is an amazing long arm quilter! I think the first time I met Tracy she was taking a class from me with another friend. They were having toooo much fun in class....it was great. My husband thinks the world of Tracy. Middle Row left: Loretta was a neighbor. She is a really sweet person. I remember when we moved from Bozeman to Denver she came over when the movers were packing up everything and she said "Don't argue, I am cleaning all your bathrooms and what ever else needs to be done." That is a true friend. Her son was the most adorable Boy Scout; I still remember him coming to our door selling popcorn. Middle row right: Carol is not only my daughter-in-law's mother but also a true friend! She is always willing to help when I go to Quilt Market or edit a pattern for me or to bounce ideas off of. She is also an amazing quilter; she has many quilts in my books. Front row left: Anna was my next door neighbor when we lived in Bozeman. She is also a long time quilting friend; we belonged to the same quilt guild when I live in Bozeman. Front row right: Diane is a truly dear friend. We met because of our children being in the same 1st grade class. She also lived close by to me; we would walk our kids to school along with our dogs. She is the one that got me started in quilting....I owe my quilting career to her. Diane was also very helpful to me when I was working on the Add-A-Quarter. We would walk the dogs and I would run ideas past her. As you can see, I have some amazing friends in Bozeman. I could write a lot more about each and every one of them; they are all very dear to my heart! The Patchworks has been sold several times since I worked there. It is currently called Main Street Quilting Company; the owner's name is Gwynn. She has the best selection of flannel that I have ever seen....it is Montana. My friends Diane and Carol holding an Add-A-Quarter at the Main Street Quilting Company in Bozeman. The Silver Thimble is owned by Libby. She is a fun loving person with a great shop. It is always fun to visit with Libby when we run into her at Quilt Market. We did a day trip to Virginia City and Nevada City, and the weather was beautiful. Notice how blue the sky is in the pictures....that is why Montana is call "The Big Sky Country". Here are photos of some of the old buildings in Nevada City. On our way back to Colorado we stopped in Buffalo, Wyoming. We stopped at the bar next to the Occidental Hotel, (for some lemonade, haha). The Occidental Hotel was built in 1880. The hotel manager was telling us stories that had happened in the hotel, very fascinating. If walls could talk. There was a hole in the floor that the clientele could go through during prohibition. They would place a rug over the opening to hide the entrance. There were also sliding compartments under the bar to stash the liquor. She also spoke of ghosts in various rooms. Of course it was also a brothel during the early days. In 1902, Owen Wister stayed at the Occidental when he wrote the book The Virginian. His room overlooks Main Street. They say there was a gun fight on Main Street and that is how he got his inspiration for the gun fight in the book. Buffalo is also the home of Craig Johnson the author of the Longmire series. They even have a store front that has campaign posters for Walt Longmire for Sheriff. They had a cute quilt shop, but we were not able to go in...it was Sunday. We were having such a wonderful time we decided to spent the night. If you spend the night you are also able to look at the various rooms if they are open. It was like walking through a museum. They had a box of various hats that we had to try on. Of course I had to show a photo with the Add-A-Quarter. They could have used the Add-A-Quarter when making this quilt. Hope you enjoyed traveling to Bozeman and other parts of Montana and Wyoming with me! When Carolyn left Texas on her recent southern quilting road trip, she headed east to Louisiana - the Pelican State. There is no shortage of quilters down on the bayou, and everyone was generous with their southern hospitality. First stop, although not strictly speaking a quilt shop, was The Oakland Plantation in Natchitoches Parish, part of the National Park Service. The plantation was founded by Jean Pierre Emanuel Prud'homme who began farming the area in 1785. The tree in the photos is 170 years old, and Carolyn is shown on the front porch of the gift shop. Quilting inspiration abounds in the plants and other natural features in this lovely setting. Quilt-N-Stitch in West Monroe, Louisiana, is a complete quilt shop as well as a BERNINA dealer. Owner Christy Dulaney in blue and Ida Rayford to her right made time to show Carolyn around the shop. Owners Ron and Louise Adams of The Fabric Shop in downtown historic Ruston have beautiful, inspiring displays and are part of a thriving sewing community. Ruston also boasts a new location for Quilteroo's, on Farmerville Highway. Photos feature Carolyn with Kathey King, Rhonda Ponder, and Melissa Ott holding the Add-A-Quarters. 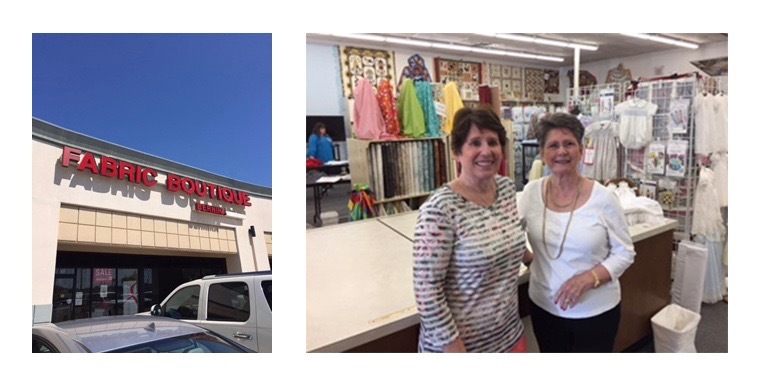 At Fabric Boutique in Bossier City, Louisiana, Carolyn caught up with owner Shirley Warren, who has been in business there since 1972. One more Mississippi stop was made at the Civil War Battlefield in Vicksburg. There were about 20,000 men that died during this battle. The photos are of the USS Cairo, the first American ironclad warship built at the beginning of the Civil War. It was named after Cairo, Illinois. It was commissioned October 1, 1862. On December 12, 1862 while clearing mines from the river the Cairo struck a "torpedo" detonated by volunteers hidden behind the river bank and sank in just 12 minutes. There were no casualties. It was raised in 1964 and placed at the Vicksburg National Military Park. Then it was back home to Colorado and the Add-A-Quarter studio! We hope you enjoyed Carolyn's big southern road trip. Check back soon for more quilty adventures on the road! 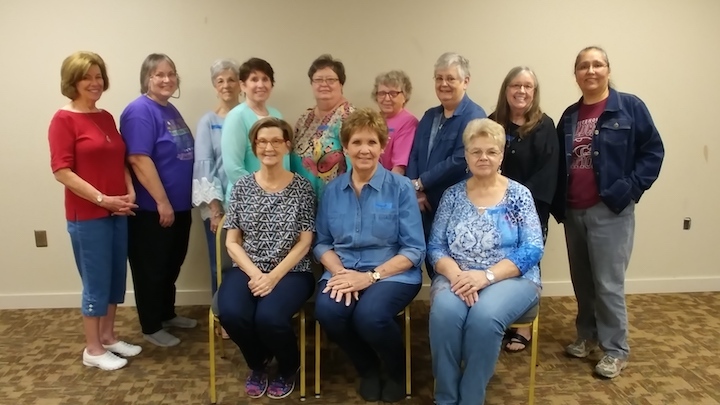 Carolyn was on the road teaching her Circle of Friends quilt in Texas recently, and we'd love to share photos of some of the places she visited and people she met along the way. First stop, the northeast Texas town of Tyler! Tyler is known as the Rose City. The garden has 32,000 bushes. The property was purchased in 1912. An application to the Works Project Administration (WPA) was made in 1938 to fund the construction of the garden. The $181,255.00 federal grant was thought to be the largest municipal park and rose garden project approved by the WPA in that era. Development of the gardens was suspended during WWII because of Tyler's vigorous war effort. The Tyler Rose Garden was officially opened in 1952. Nearly 3,000 rose bushes were used in the first planting. Of course, Tyler is also a quilting town! Carolyn's class for the Quilters' Guild of East Texas took place there. The students were great and much quilting fun was had. While in town, A Nimble Thimble was one of Carolyn's first shopping stops. Employee Christine Brosky was nice to pose for a quick photo with Carolyn. Check out all that colorful fabric! Sharman's Sewing Center also has a shop in Tyler. The store is named after the owner, shown with Carolyn in the photo at left below. Sharman has an additional store in Longview, Texas. Employees in the photo below right are Cindy Newland in red, Petrina Cude in purple, and Amy Reed in green. Next stop was Stitchin' Heaven in Mineola,Texas, just 25 miles northeast of Tyler. Deb Lutrell's shop bills itself as Texas' premier quilt shop, and it is also a mighty force in the online quilting world. Carolyn visited with Block of the Month manager Michelle (and bovine friend). Last stop in Texas was Terrell, 50 miles west of Mineola. 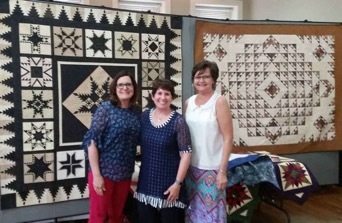 These East Texas quilt shops made a great mini quilting road trip all by themselves! At Quilter's Apprentice, Carolyn visited with employees Laurie and Martha, shown below. In our next quilting road trip post, it's on to Louisiana! Check back soon for more of Carolyn's adventures. Make a New "Circle of Friends"
Yes, all those lovely curves are paper pieced. With a few scrap fabrics and an Add-A-Quarter ruler, you can make your own Circle of Friends as well - it's easy! Carolyn teaches this workshop all across the country, in fact she's at the Quilters' Guild of East Texas this week sharing her techniques (see details here). But you can make this quilt on your own as well with Carolyn's instant-download Circle of Friends quilt pattern. No matter where you make it, we're sure it's going to be a new favorite. After all, friends are the fabric of life, so why not celebrate them in a quilt? What colors can you imagine for your version of Circle of Friends? There comes a time in every quilter’s life that they need to tackle “the scrap box” or in my case the boxes. I have been collecting scraps for 30 years. I started to organize my scraps a few weeks ago and believe me it was not pretty. I had scraps all over. I am embarrassed to say that I have NEVER organized my scraps. Done with a quilt…scraps are thrown into “the box”. After all these years why start now? Well, my mother-in-law passed away in January; she was 98 years old. She lived on a farm all her life and was a very hard-working woman. 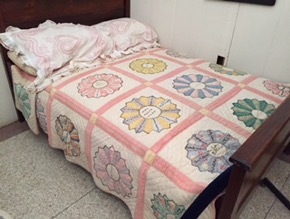 Years ago, she gave me a quilt that her mother and grandmother made, I believe in 1918. That quilt is one that I have always wanted to copy using scraps. Thus my inspiration to organize my scraps. I want to first say that I am not an expert on scrap quilts. I just make what I like. I really had fun (when I first started); I must say organizing 3 boxes of scraps did take a while. I did not organize by color. I organize by size. Here is something I should pass on…don’t keep any really small scraps unless you like to make miniature quilts. It was a great trip down memory lane; remember I had been “collecting scraps” for 30 years. I had fabrics from my very first quilt! On the bright side I still use that quilt today. My scraps also told me what phase of my quilting life I was in…blue, red, green, or reproduction. I even found troll fabric (from when it was popular the first time); my daughter loved trolls. So, my advice to you is start organizing those scraps. Put on your favorite music…not HGTV (it is too distracting)…and start organizing. Post a before or after photo by midnight, March 31. On April 1 (no fooling! ), we will select the winners by random drawings...I can’t be judgmental. Each winner will receive a copy of the Roaring Through the 20’s book. Пиротехническая компания Земля/Воздух уже более 10 лет раскрашивает небо салютами и фейерверками, комбинируя яркие цвета, необычные формы, высоту раскатов, скорость залпов и различные спецэффекты. Они похожи на природные явления неописуемой красоты — очень органичны и естественны, и при этом необычайно красивы и грандиозны.